Sarah's Coco-nutty Granola is one of the most popular recipes in her first book, I Quit Sugar, and on the blog. So, in her second book, I Quit Sugar For Life, she pimped the original recipe with some raw cacao powder for a chocolatey hit, yum! 2 cups mixed almonds, cashews, pecans, walnuts and pepitas (preferably activated, roughly chopped). 1 teaspoon ground cinnamon (optional). 2 teaspoons rice malt syrup (optional). 1/2 cup Greek-style full-fat yoghurt or unsweetened coconut yoghurt, to serve. 1. Preheat oven to 120ºC / 250°F / Gas Mark ½ and line a baking tray with baking paper. 2. Combine all ingredients (except yoghurt), then spread evenly on the tray. 3. Bake for about 20-25 minutes until golden, turning halfway through the cooking time. The darker it is, the crunchier it will be. 4. Remove from the oven and allow to cool. 5. Store it in an airtight container in the pantry for up to 2 weeks (or in the freezer for even longer!). To serve, spoon the yoghurt into a glass jar or bowl and top with 1/2 cup of granola. 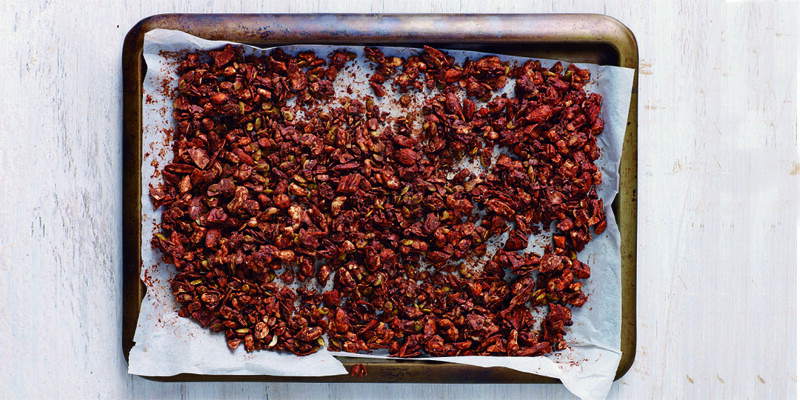 We like to make this granola without any sweetener at all. However, if you do want to sweeten it a little, we recommend Purehavest Organic Rice Malt Syrup.